At the end of 2016, rural families across the Horn of Africa were facing the increasing threat of severe hunger following the failure of two consecutive rainy seasons. In Ethiopia, depleting pastures and water sources meant the livestock-dependent pastoralists who live in the driest areas were at risk. As the drought deepened, livestock owners struggled to find ways to keep their animals alive. Mahabo Hassen Hared, a livestock owner from the outskirts of Warder District, Somali Region was particularly concerned about the rapidly changing conditions. “We were pure livestock farmers. 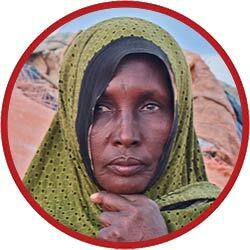 We used to follow the water and grass”, said Mahabo outside her aqal-somali, or hut. In these areas, livestock are essential for survival. The animals provide the family with milk and serve as an important vehicle to fetch water and transport grain. As the drought set in, Mahabo noticed that “my animals became malnourished and then died from common diseases. They had no immunity.” Hany Abdullahi Aaden, from Daratole District also began to feel the drought’s effect. She relied heavily on milk from her livestock as a key source of nutrients, for herself and her six children. But, as the animals grew weaker, they produced less and less milk. As conditions worsened, livestock owners had to walk further and further in search of water and pasture for their animals. 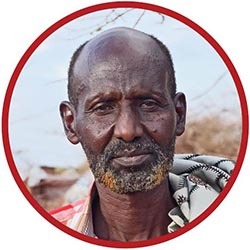 Yusuf Salad, a farmer also from Warder District, highlighted his struggle to move his herd to find water sources. “We walked slowly”, he said, “so that the animals could eat a little of what we found along the way”. Yusuf walked for four days after hearing that support for his family’s animals was available from FAO and other agencies. He, Mahabo and Hany were all assisted under the Early Warning – Early Action (EWEA) programme. With signs of drought emerging in September 2016, FAO had acted quickly. Approximately USD 400 000 was released from FAO’s newly established Early Action Fund - under the Special Fund for Emergency and Rehabilitation Activities - to support the worst hit districts of Ethiopia. Mahabo, Yusuf and Hany were three out of the 9 600 households who received supplementary feed, multi-nutrient blocks and animal health treatments for their livestock. Acting early can mitigate the most severe effects of disasters on communities. Not only does it save lives, it also protects their assets and livelihoods. In developing countries, significant parts of the population live beneath the poverty line. Those who live just above it can rapidly be pushed back into poverty by sudden shocks. Protecting vulnerable communities’ assets ensures they do not fall deeper into the downward spiral of poverty and have more resilience to withstand future shocks. By safeguarding livestock, FAO enabled drought-affected livestock owners to protect their remaining animals at the peak of the drought. For pastoralists such as Mahabo, Yusuf and Hany, livestock is their lifeline. It is their main source of both food and income and a critical source of nutrition for children. It’s also an important intervention for savings assets, helping them to afford medical care for a sick family member or to pay school fees. For Mahabo, once the health of her goats had improved, she sold 20 to buy food and other necessities for her family. “If there had been no support from FAO support, more animals - maybe even people - would have died,” she said. 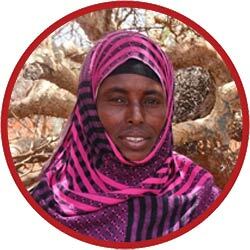 FAO’s timely assistance allowed her to keep her remaining livestock alive while they regained their strength. “They are now strong enough to eat the grass which grew after we had some light rains recently,” Mahabo says. She hopes they will soon be well enough to start breeding again and give her family milk once more. However, as drought conditions continue in Ethiopia’s Somali Region, many vulnerable households are still at risk of severe hunger and malnutrition. The situation has worsened with a fourth poor rainy season. A potential fifth is forecasted. Vulnerable herders need continued and scaled up support to prevent further livestock losses and begin to rebuild stronger, more resilient livelihoods.